During the "Think Beyond" event, HP made one or two noteworthy announcements, but none caused more confusion (and excitement) than the one HP is to integrate webOS into its computers. Phil McKinney, CTO of HP's personal systems group, gave an interview for The Seattle Times, and shed some light on this issue. "Q: So HP's taking Apple's approach, with integrated software and hardware development? A: I think the key is that if you want to differentiate in the marketplace you need to be able to control the key points of the differentiation." 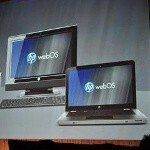 We don't know about you, but we can't wait to taste the webOS integration on our PCs. you know nothing. webOS is the best. the way that palm (and HP) have marketed it and handled it in general is garbage. how what? is webos the best? have you used it? it hasnt sold well at all, but it is unbelievably easy to use. the integration of common flicks and swipes makes doing so many frequently done actions incredibly intuitive. the card system makes multitasking a dream. it lacks plenty due to being undersold and thus underdeveloped, but the base layer is amazing. 2.0 should bring lots more functionality. i would love to see nothing more than webOS taking off and finding lots of dev support.